The modern world of 2013 is the world of smart phone. There is a tough competition in between the topmost mobile companies to win the race of becoming the provider of the best smart phone of the year. The two top most competitors of this race are Samsung Galaxy S4 and Sony Xperia Z, but which is better can only be judged when they are compared on the field of design, screen, software, specs etc. The Samsung Galaxy S4 and Sony Xperia Z both have 5 inches screen with full HD display. The size and resolution in both the phones are similar. The screens of both the phones are large enough to feel huge in the hand. The Sony Xperia Z uses traditional LCD type screen whereas Galaxy S4 has super AMOLED screen. 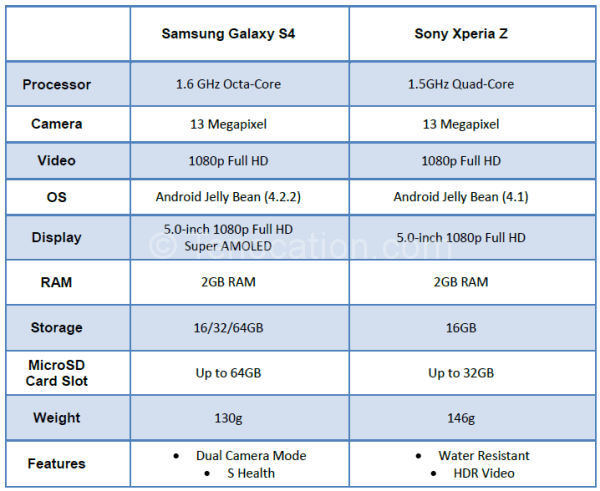 On the basis of screen Samsung Galaxy’s AMOLED wins as it is great but Sony Xperia’s screen is good not great. The screen of Galaxy S4 offers superior contrast while Xperia Z bleeds unrequited back light. Though both the phones have 5 inch screen and are pretty huge but the design and style are quite different from each other. Samsung Galaxy S4 is 130 g in weight and 7.9mm in thickness and has plastic body with removal battery cover and gorilla glass 3 screen surfaces. However, Sony Xperia Z is 146 g in weight and 7.5 mm in thickness with IP57 waterproofing, Samsung have a thick plastic body making it lighter. Because of its curvier corner Galaxy S4 has greater expression of slimness but Sony Xperia Z has boxy square edge slimming down the corner as much as possible. Sony Xperia Z has only the feature of IP certified means waterproof up to a certain level. Its waterproofing rate is IP57 means it can be merged in 1m of water for at least 30 minutes. It is due to a flap that covers the full phone’s port. The phone is designed in such a way that if all the ports are flipped out the phone does not look good. In other words, it is a kind of insurance. Samsung Galaxy S4 does not have the memory card slot on its side; instead it is under back cover. Both the phones have excellent wired and wireless connectivity. Both the phones have micro USB port, microSD slot, wi-fi, Bluetooth 4.0, NFC. On the hardware side the Samsung Galaxy S4 has its micro USB port is on its bottom edge while the Xperia Z has on its top left edge to charge the battery and transfer data. On the basis of wireless side both the phones have Bluetooth, GPS, 4G, and NFC. The storage capacity of Galaxy S4 is 16/32/64GB while Xperia Z has 16GB microSD. Both the phones have expandable memory storage. Samsung Galaxy S4 has its memory card slot under its battery cover. The Sony Xperia Z has a flap on the top edge for its memory card. Though both the phones have battery of 2600 mAh but the Galaxy S4 has higher capacity than Xperia Z.